Our Raspberry Pi comes with a modern HDMI video output. This means that you'll have to connect this cheap computer to a relatively new monitor. Out of the box it is not possible to connect the Raspberry Pi to a cheap second hand LCD monitor, even though such a setup could be quite interesting. And please note that most existing beamers don't have an HDMI input either. That's where an HDMI to VGA adapter comes in. I have bought mine from Deal Extreme for $12. This price is right in line with the price of the Raspberry Pi and second hand LCD monitors. The unit works very well, even up until full HD format, including sound. Sound is coupled through a stereo jack cord. The unit is really plug and play. There is no need to change any of the settings. Well, there may be one thing you might want to change. If your monitor can handle it you might want to disable "overscan" in the raspbian-config tool. This removes the black border around the picture and releases the full HD capabilities of your RPi. 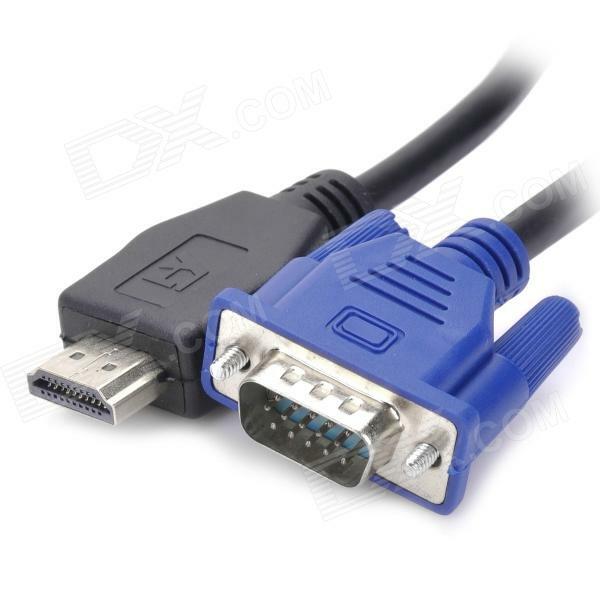 Later I have learned that it is also possible to use a passive HDMI to VGA adapter cable to connect a VGA monitor to your Raspberry Pi. This won't work out of the box though, you'll need to change some settings before it works. And even if it does work, it will only support video. Audio will still come from the on board audio output, with the possible danger of lip-sync problems between audio and video. A passive cable like this one at Deal Extreme costs only $7,50. 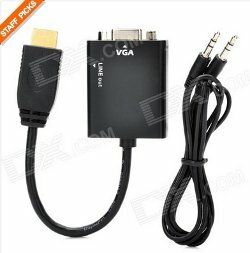 However because of the need to make the above mentioned changes I prefer the active VGA converter, even if it costs some $5 more. Before you can use a passive adapter you'll need to make some changes in a configuration file. This also implies that you'll have to undo those changes again if you connect an HDMI monitor to the Raspberry Pi again. And you may have to experiment with some of the settings to adapt the output to the capabilities of your monitor. You will also need to edit these two lines, changing hdmi_group to 2 and hdmi_mode to 16. After saving the file you'll have to reboot your system before the new settings take effect. It's time for a plug and play device again. A tiny computer deserves a tiny keyboard if you ask me. 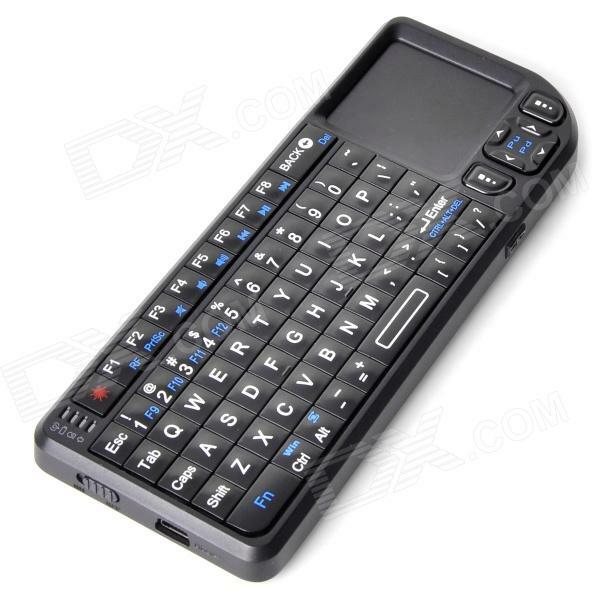 And here it is, a mini wireless keyboard/mouspad from Deal Extreme for only $23.90. It comes with an RF dongle which plugs into one of the RPi's USB ports. The keyboard is powered by its own rechargeable battery, which is good for about 4 hours of continuous operation. The battery can be recharged by a mini USB cable, during which the keyboard can still be used. I was a bit disappointed by the operating range, but what could you expect for this price?! You may see the last key repeating very fast if you're at the edge of the maximum distance between keyboard and RF dongle. Apart from the operating range the keyboard performs very well. The keys are also slightly illuminated when you press them, so you can also use the keyboard in a dark situation. And as a bonus the keyboard comes with a built in laser pointer. So you can also use this keyboard to control the slides during your presentations about the Raspberry Pi at your local interest groups.